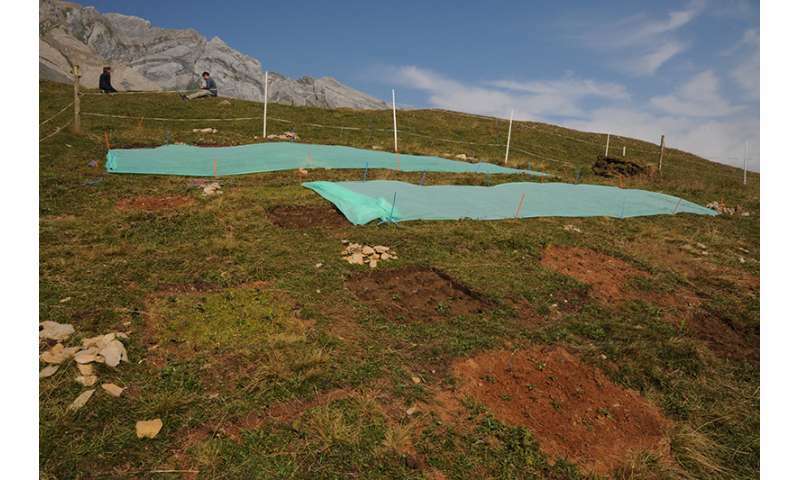 Experimental site at 2,000 meters above sea level where indigenous alpine plants face migrant plant competitors. Credit: ETH Zurich/Peter Rüegg. With climate change and rising average temperatures, many wild animals and plants are being forced into new habitats, their distributions shifting in elevation and latitude with differing velocities. For alpine plants, this could mean facing competition from species unknown to them, such as plants found at lower elevations today that migrate to higher elevations due to climate change. A new study, published this week in Nature, by Jeffrey M. Diez, an assistant professor of plant ecology at the University of California, Riverside, and colleagues now provides the first empirical evidence that this new source of competition among plants could be decisive and contributes to growing evidence that changing species interactions are more important than the direct effects of temperature after climate warming. "When species migrate to different environments to keep up with changes in climate, they encounter new competitors, and engage in new interactions within ecological communities," Diez said. "To accurately predict species' responses to climate change, future forecasts should account for new competitor species affecting ecological communities." To replicate the effects of rising temperatures on plant species' interactions, the researchers transplanted alpine plant species and intact plant communities to different elevations along a mountain slope near Chur in the Swiss Alps. Specifically, they transplanted four characteristic plant species - spring pasqueflower, alpine kidney vetch, glossy scabious and black plantain - from their current location in an alpine meadow to a new home 600 metres lower down the mountain. (This move simulated the expected rise of about 3 degrees in average temperature for Switzerland over the next 50 to 100 years.) Then for two years the researchers studied how the plants performed. Three-degree temperature change: Alpine flora from 2,000 meters above sea level replanted at an elevation of 1,400 meters. Credit: ETH Zurich/Peter Rüegg. They tested scenarios in which alpine plants remain at their location in a warmer climate and are either invaded by species from lower elevations, or remain competing with their current alpine community. They also tested scenarios in which the alpine plants manage to migrate upwards, where they encounter high-alpine plant communities or their current competitors that migrate along with them. They found that those alpine species that did not migrate to adjust to higher temperatures performed poorly if new competitors moved in and joined them. When they did migrate to adjust to rising temperatures, however, they performed well even if they moved into a new community of competitors. "The decisive factor that will make life difficult for alpine plants in future is competition, and competition from novel low elevation migrants in particular," said Jake Alexander, the lead author of the study and a scientist at the Institute of Integrative Biology, ETH Zurich, Switzerland. "Our study provides one of the first empirical indications that competition with new 'range expanders' has to be taken into account when forecasting species' responses to climate change," Alexander said.